Did you know that AirAsia Zest flies from Manila? Yes you read it right! AirAsia Zest is now in Manila and may now take you to your destination at affordable prices (AirAsia Zest dares you to compare prices!). Zest Air was rebranded as AirAsia Zest as per approval of Civil Aeronautics Board ("CAB"). AirAsia Zest Chairman Mikee Romero said in their press release last September 20, 2013, “We are excited to introduce AirAsia Zest, and what it represents. With our alliance, we are well positioned to offer our guests the strength of our combined network of domestic and international routes and unrivalled daily low fares, proving a world class travel experience that every Filipino deserves. I love travelling. In fact, I have a separate savings jar especially allocated for travel adventures. May it be locally or internationally, may it be via jeep, bus, train, ship or plane, may it be nature trip or simply wandering on the busy streets of urban life. Puerto Princesa is also named The Greenest city of the Philippines primarily because of it's composition. A lot of travelers visit Puerto Princesa every year because of it's attractions like Puerto Princesa Subterranean River, Tubabataha Reef, Honda Bay, Sabang Beach, and Ugong Rock to name a few. I would love to experience jumping of a cliff, scuba diving in one of the worlds' most beautiful under water life and to pass the very famous Subterranean River. I love BEACHES! I really like the sound of the waves and the touch of cool sea breeze. I like how the sand stimulates my sense of calmness. Sad to say, I never been to Boracay. I've been to the islands of Camarines Sur, Puerto Galera, Zambales and Batangas but my beach list would definitely not be complete if I'll not experience the lovely island of Boracay. Some of the activities you can do in Boracay are as follows Scuba Diving, Glass Bottom, Boat Trip, Banana Riding, Water Skiing, Parasailing, Snorkeling, Skimboarding, Paraw Sailing, Kitesurfing, Windsurfing, Fishing, Horseback Riding. I'll do all of this If I'll be given a chance! The top destination I want to go to is Incheon, South Korea. Not because of the KPop invasion but because I'm really interested on their culture. I want to know Koreans and their heritage! I know I deserve to WIN this UNIQUE opportunity to travel places and exchange cultures because I have that strong passion for DISCOVERY. I am hungry for KNOWLEDGE that I can gain through EXPERIENCES. I want to touch people's lives one step at a time, in my own little ways. I want to inspire them through my blog entries and to let them know my point of views anything under the sun. Sharing my thoughts with my readers give me a sense of freedom to have that opportunity to be part of their lives. Having their feedback let me feel that we have connected and therefore exchanging of ideas will come to life. I want to represent also those people who are still a newbie in travelling and blogging and want them to know that it's possible to be part of almost an 'impossible dream'. If I'll be given a chance to be part of this once in a lifetime experience, I will forever share whatever experiences I'll gain from it to my family, friends, relatives, acquaintances etc. I'm proud to be a Filipino, a blogger, a social media evangelist and advocate. 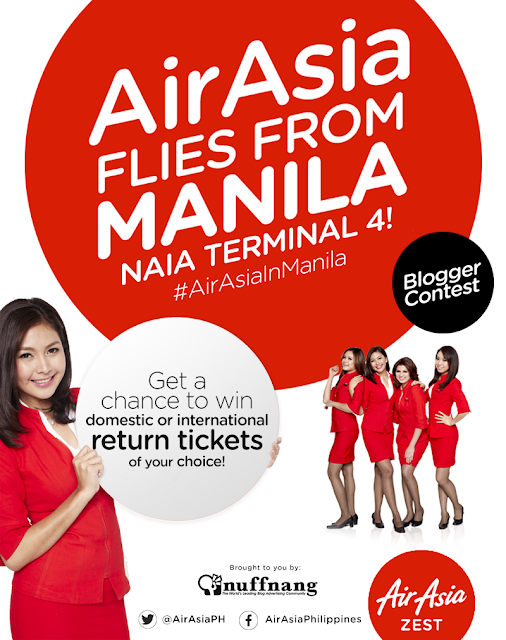 It's more fun to Travel in the Philippines with AirAsia!